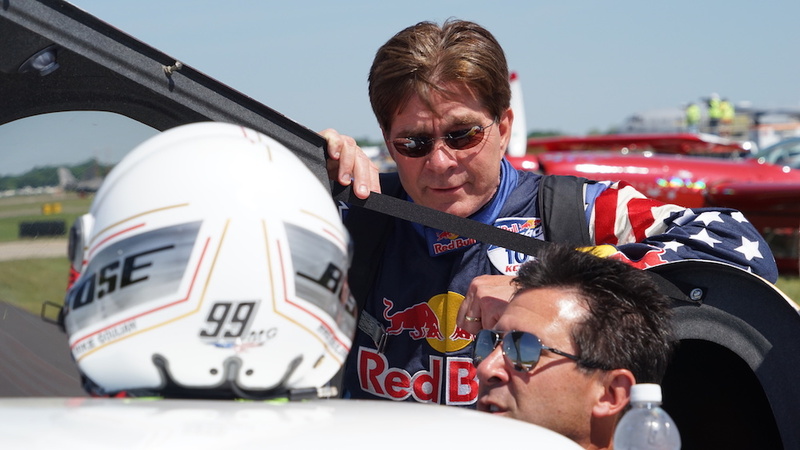 Michael Goulian and Kirby Chambliss, the two US RBAR pilots, friends and competitors. Given their recent efforts, American pilots Kirby Chambliss and Michael Goulian both have strong potential for the race podium at the third stop of the 2016 Red Bull Air Race World Championship in Chiba, Japan this weekend. Success could put either pilot closer to – or among – the top three in the overall standings. The second stop of the Red Bull Air Race season at Spielberg, Austria in April was remarkable for serving up the first snowflakes since the World Championship era began in 2005. But for American pilots Michael Goulian and Kirby Chambliss, the stop was notable for more personal reasons. Team Goulian and Team Chambliss each delivered an effort demonstrating that their first race podium of 2016 is well within reach, and as the 230mph action returns to the heat and humidity of Chiba, Japan this weekend, both teams are in the thick of the fight for the overall podium as well. The friendly rivals from different parts of the USA (Arizona for Chambliss and Massachusetts for Goulian) faced each other in the opening Round of 14 in Spielberg, and in a close face-off it was the two-time titleholder Chambliss who advanced to the Round of 8. In fifth place overall as Chiba speeds into view, Chambliss is tied in the World Championship points (11) with Canada’s Pete McLeod, and only a single point separates them from the third spot currently held by Austria’s Hannes Arch. Michael Goulian of the United States prepares for his flight during the qualifying day of the second stage of the Red Bull Air Race World Championship at the Red Bull Ring in Spielberg, Austria on April 23, 2016. Photo courtesy Red Bull Content Pool. Goulian is carrying strong momentum from Spielberg, too. While he was the unlucky one in the all-American head-to-head, leading up to Race Day in the Alps he had topped the time sheets in two of three Free Practice sessions. With only six points separating him from third overall in the packed field of the world’s top pilots, and 15 points awarded to a race winner, a stellar result over Tokyo Bay could launch Team Goulian’s #99 into serious contention for the World Championship podium before the eight-race season even hits its midway point. In the Red Bull Air Race, which is the official world championship of the Fédération Aéronautique Internationale (FAI), the world’s top pilots hit speeds of 370kmh while enduring forces of up to 10G as they navigathttp://www.redbullairrace.com/en_US/event/chiba-2016e a low-level slalom track marked by 25-meter-high, air-filled pylons. It’s the ultimate motorsport series in the sky. Press Release by Red Bull Air Race Media.